Trick-or-Treat, smell my feet, give me something good to eat. With Halloween right around the corner, this familiar jingle will soon be buzzing around neighborhoods. Halloween, which is celebrated October 31, originates back to an ancient Celtic festivity known as Samhain. Out of 130 randomly surveyed students in English classes, 68% do not know the exact origin of Halloween. “I always thought Halloween was about the guy who gets his head cut off and uses a jack-o’-lantern as a head,” senior Benjamin Poe said. According to history.com, over 2,000 years ago, the Celts honored their new year on November 1. The New Year meant that summer was ending and winter, the time of year associated with human death, was beginning. Samhain occurred the night before the New Year, October 31, when it was concluded that the border between the living world and the dead world became blurred. It was also believed that ghosts crossed the border into the living world. During the celebration of Samhain, the Celts would wear costumes made of animal heads and skins. At this festival, fortunes were often told and people would light hearth fires to provide comfort and protection from the dark winter approaching. Christianity had spread into Celtic lands by the ninth century, joining and replacing older Celtic rituals with Christian values. By 1,000 A.D., the Catholic Church made November 1 All Saint’s Day and November 2 All Soul’s Day. Both of these days are similar to Samhain, but are more church-friendly. All Saint’s Day is a day dedicated to the dead who are now saints in heaven, while All Soul’s Day is more focused for those souls in Purgatory. (Purgatory is the place of temporary punishment before going to heaven.) All Saint’s Day was also known as All-Hallows, making the night before, October 31, All-Hallows Eve. All-Hallows Eve eventually turned into the name most people are familiar with- Halloween. Halloween was more accepting in Maryland and other southern colonies during colonial times due to the Protestant belief limiting the celebration. Colonial Americans commemorated Halloween by having “play parties.” These parties were public events held to share haunting stories, tell fortunes, dance, and sing. By the late 1800s, Halloween was transformed into a holiday more focused on the living community than the dead souls. The frightening aspect of the holiday was stripped and replaced with neighborhood-friendly customs. Halloween was no longer a religious and haunting celebration for the no longer living. Today, over $6 billion are spent on Halloween, making the holiday the second largest commercial holiday, Christmas being the first. There are numerous ways that Americans celebrate Halloween today, trick-or-treating being the most popular. 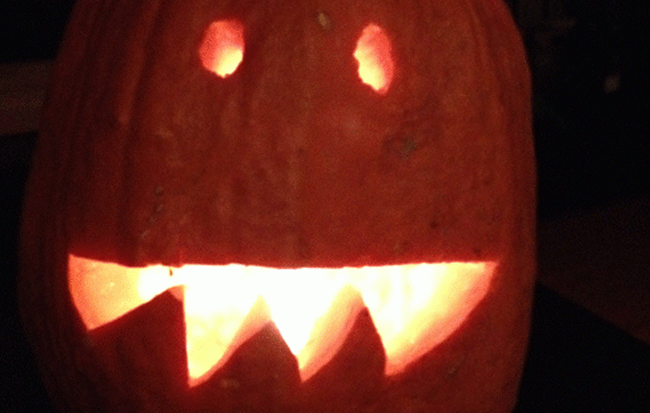 90% of students said they went trick-or-treating as a child. The same number of students say they actively participate in Halloween today. 57% of students attend fearful attractions, such as Ashland Berry Farms or Halloween Haunt at Kings Dominion. Costume parties and going to the pumpkin patch are other popular ways to celebrate Halloween. “My favorite part about Halloween is the costume parties because it’s fun to get dressed up and enjoy the free candy,” junior Anthony Carter said. While Halloween may have lost some of the connection to its origin, some still celebrate the holiday with traditional customs. Those trying to keep the tradition alive leave candy outside of their front door to prevent ghosts from entering their homes. Some explain that dressing up in costume at night is to blend in with the spirits, which prevents those spirits from capturing their souls. In today’s society, some religions are against the celebration of Halloween due to its pagan roots. It is commonly mistaken that Halloween is the “Devil’s Holiday”, or that Halloween was created for the Devil. In reality, Halloween was created to ward off evil spirits. The Celts did not believe in Hell, they believed in automatic reincarnation. While some still associate Halloween with religion, whether they are right or wrong, and other traditional values from the past, the holiday is steadily changing. The true meaning, much like with any holiday today, is fading. Halloween is commonly thought of now as a time for eating candy, attending parties, and going to scary attractions. Most students do not even know, or only have a general idea of, why we do those fun things on this holiday. “It is important that our generation keeps the true value of Halloween alive. If we don’t, then Halloween will eventually become a meaning-less holiday that we spend hundreds of dollars on. Halloween is one of the most fun times of the year, I just wish people knew more about it,” junior Nicholas Glasscock said. I enjoyed reading this article because I wanted to know more about the origin of Halloween for I was not familiar with it. This article provided great insight as to how Halloween emerged and ways that some attempt to keep the tradition alive in today’s society. I remember as a little girl I used to dress up in costumes each year until I was about 13 years old. Now, I just go to places like Ashland Berry Farm or Busch Gardens to see the spooky attractions they have to offer. Halloween parties are also fun to go to. I believe that the importance of Halloween or the excitement has dwindled somewhat, but what I’m wondering is what can we do today to revive the spirit of Halloween? How can we explain its importance to people in our society? Before reading this article, I did not know about the origin of Halloween. It is one of my favorite holidays though. I love watching scary movies and going through scary attractions. This year I went to Busch Gardens and that was really fun. I don’t go trick-or-treating anymore, but I do attend at least one party so I still have an excuse to dress up. I personally don’t celebrate Halloween due to religious purposes. Although i think it is very interesting to see where it originated from. I find it interesting that the Celts celebrated new years after summer. It reminds me of poetry and how most poems symbolize winter with death.